The following content is taken from our sister site Paignton.com where more pictures and information can be found. We thought that this would make a good day out from Torquay and is only a few miles away and from their you can move on to Totnes for a cultural experience and visit some of the more esoteric shops. 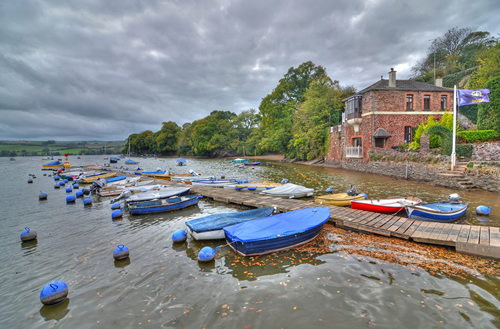 Stoke Gabriel itself is quietly located and largely unknown in South Devon, and can be found on a small creek/inlet of the River Dart. This is a real “local” village, unspoilt by time and still retains marks of its heritage, from the 1000 year old churchyard yew tree in the churchyard to the wharf and water frontage where children fish for crabs and and mullet swarm on warm summer evenings. There was already a church at Stoke Gabriel, almost a thousand years ago.The present “St Mary & St Gabriel” church consists of the 13th century tower and 15th century church body The famous yew tree which is reputed to be over 1000 years old is an attraction for visitors who can be seen walking backwards three times around the yew. The theory is their wishes will then come true. Alongside this ancient church is the “Orchard”, one of the last remaining ancient apple orchards in south Devon.